After their initial inception as a schoolboy band named The Scorpions in 1962, and following a number of band name and personnel changes, Status Quo eventually hit the charts in 1968 with the massive hit single `Pictures of Matchstick Men'. However, it wasn't until they ditched their psychedelic duds and took on the denim, accompanied by a radical gear-shift from teenage-friendly pop to out-and-out electric boogie that they came into their own, defining the rock music genre for many throughout the 1970s. A raft of hugely successful albums followed that are still held in awe by an army of loyal fans; the release of `Piledriver' in 1972 heralded a purple patch in which twelve consecutive long-players charted in the UK top 10. The classic `Frantic Four' lineup of Rossi, Parfitt, Lancaster and Coghlan started to disintegrate in 1981 and eventually imploded after Live Aid in 1985. 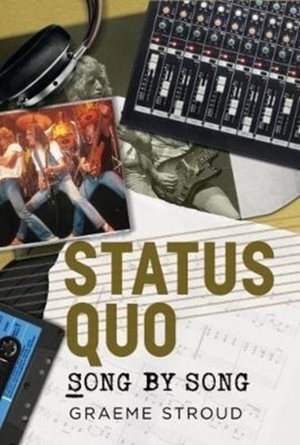 Although Quo have gone on to post over sixty UK chart hits in no less than six separate decades, this publication focuses on those days of glory, song by song from their earliest recordings until the demise of the classic line-up.